We are reliable and efficient. No job is to big or too hard for us. 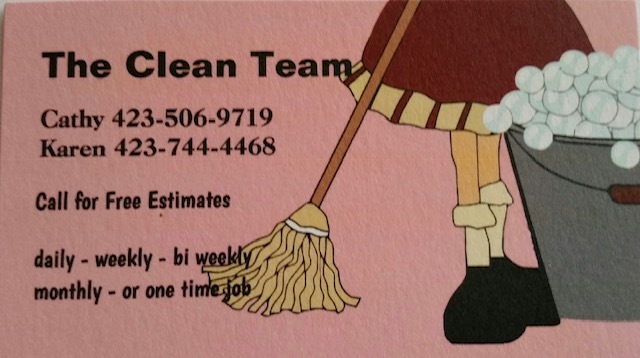 If you are looking for someone to clean your home, office or other buildings give us a call. Move In /Moving out – one time cleaning. Weekly, daily or occasional cleaning. We are professional and trustworthy. We are located in McMinn County. Call or text Karen or Cathy. Leave a message and we will return your call/text. 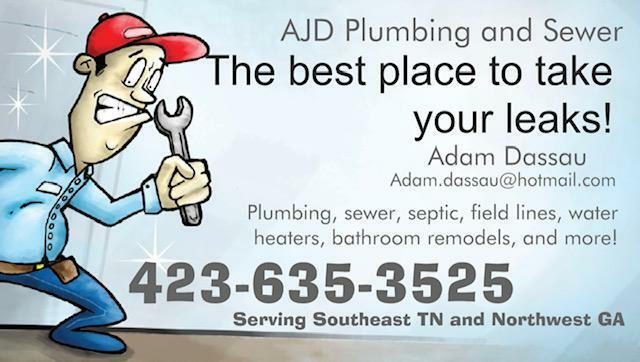 AJD Plumbing and Sewer has the experience and knowledge to get all your plumbing or sewer problems fixed right the first time. Reasonable honest rates. No job too big or too small. We look forward to hearing from you! Do you have a past PERSONAL or FAMILY history of Cancer? Contact me to qualify for a FREE painless genetic cancer screening ! Bush hog and tractor work. Free estimates. 35 hp tractor with loader and 6 foot bush hog. 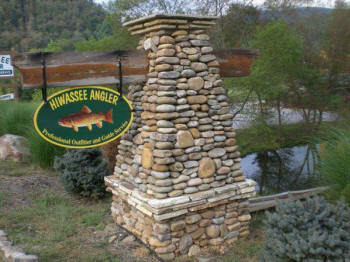 Located in McMinn County, TN. CMC Portable Buildings and Shed Movers. We have Free Delivery and Setup, No Credit Check and No Payment for 30 days. We are located in Cleveland, Athens and Madisonville Tennessee. You can reach us Monday- Friday & 9-5 Saturday 9-1. PAINT PROFESSIONALS We are a full-service painting company serving the Chattanooga Tennessee and surrounding areas for 30 years. Throughout the years we have painted hundreds of residential, commercial, and public works projects. Our goal has always been focused on delivering high-quality craftsmanship to our customers. Our expertise is high quality, custom residential painting interior and exterior. No job is too small. 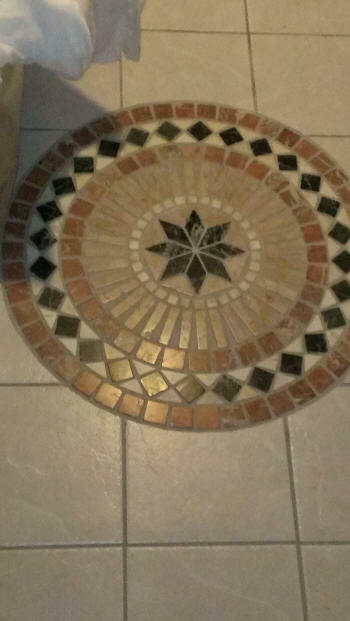 Contact Susan for a free Estimate in Cleveland, Chattanooga, Knoxville and surrounding areas. Please call Susan 423 715 4914. This is also a personal cell phone so please leave a message if no answer and I will contact you as soon as possible. We repair and work on all makes and models. We also fix chargers. 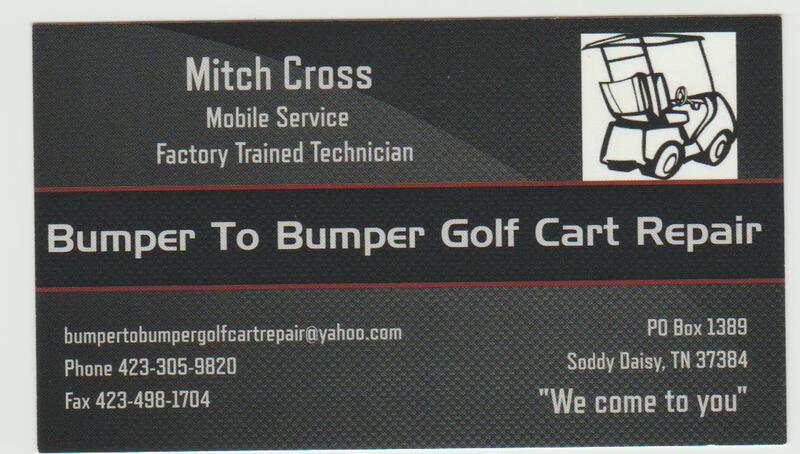 golf cart repairs. We are family owned and operated. Licensed and insured. "We come to you". Contact me with any questions or for more information! Clearing, Driveways​, Basements, Footings and Septic. Free Estimates and Reasonable Rates. Welding repair, fabrication and steel sales. 40 years experience and the best rates in town. Lawn mower decks, utility trailers, landscaping equipment, trailers and trucks. Farm equipment, bush hogs, plows, 3 point hitches. Dump truck beds, Tow trucks. Plastic welding is available for most types of plastics. Guaranteed best steel prices in town. Materials can be cut to length. Available 5:00 pm to 7:00 pm Monday thru Thursday. 8:00 am to 5:00 pm Friday and Saturday. Call anytime and please leave message, I will return your call as soon as possible. Backhoe work at reasonable prices. Servicing Monroe and Loudon county areas. Specializing in French drains, ditches, driveways and more. 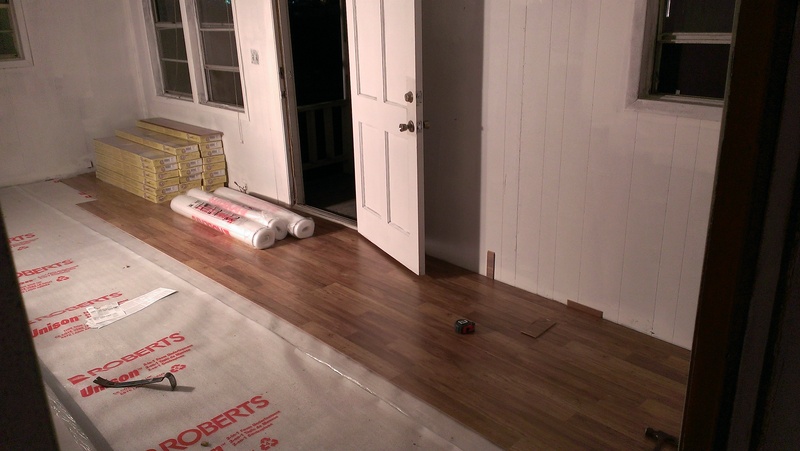 Call Jeff at 423-650-8555 for a free quote. Babysitting: I am 24 years old with two 6 year olds and am looking to babysit children at my house Monday-Saturday between hours of 4:30 and 10:00 pm. Also offering full time child care during the summer Monday- Friday 6:00 am- 5:00 pm. I am CPR and First AID certified. Smoke Free Home. Fenced in Backyard. Will provide Snacks. Hate Cleaning? I love it! Just don't have the time to clean? I do! I will provide reliable and top quality cleaning for your home. I have 5 years’ experience in the cleaning industry. I am a very detail oriented person and will treat your home as if it was mine! I am insured. I offer a 100% guarantee on my cleaning services. I offer free estimates, priced by job, or contract, which ever you prefer. Frequency Offered: Weekly, Biweekly, and Monthly. Whatever you prefer! Services Offered: Dust, Sweep, Mop, Vacuum, Clean Kitchen (Appliances included), Change Bed Sheets if preferred, Ceiling Fans, Wash Dishes, Bathrooms and additional as requested services. I use my own equipment and cleaning supplies, however I will use supplies that you prefer to be used in your home. Call or text Amanda and leave the annoying cleaning to me! 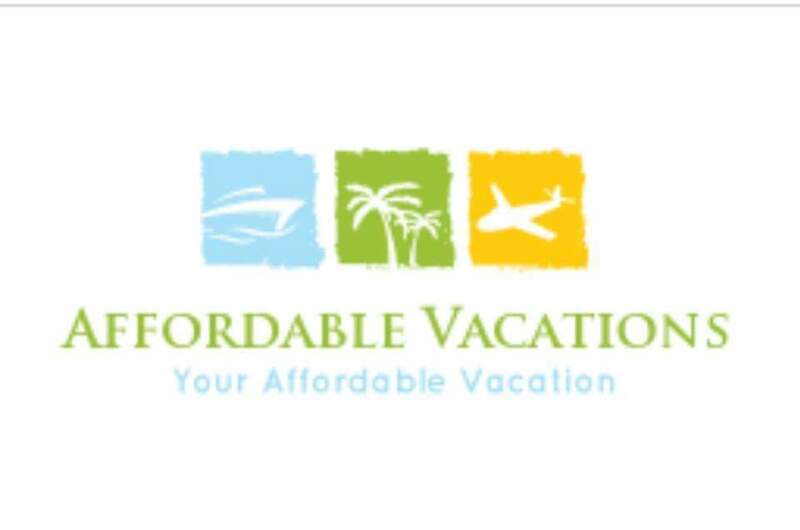 Here at Affordable Vacations, we offer a variety of services. Let us make your next vacation Hassle Free. We plan, book, and even have Layaway options for Individual, Family, and Groups. 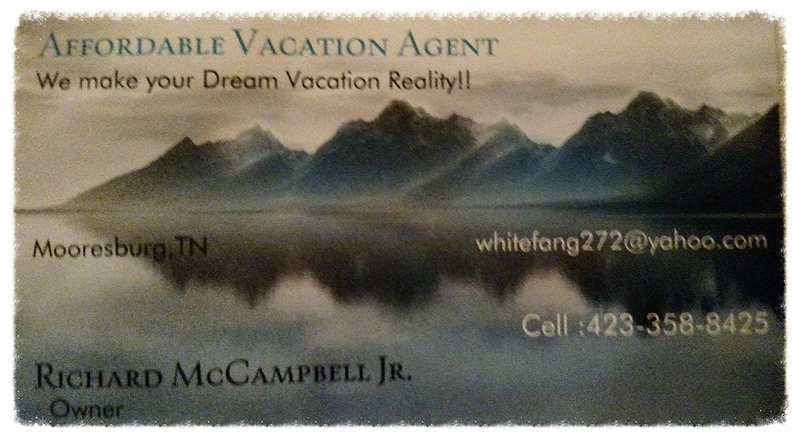 Cruise, Flights, Hotels, Resorts, Rental Cars, Family Vacation Packages, Disney World Packages are all our Specialties. Lowest Prices Gurenteed! 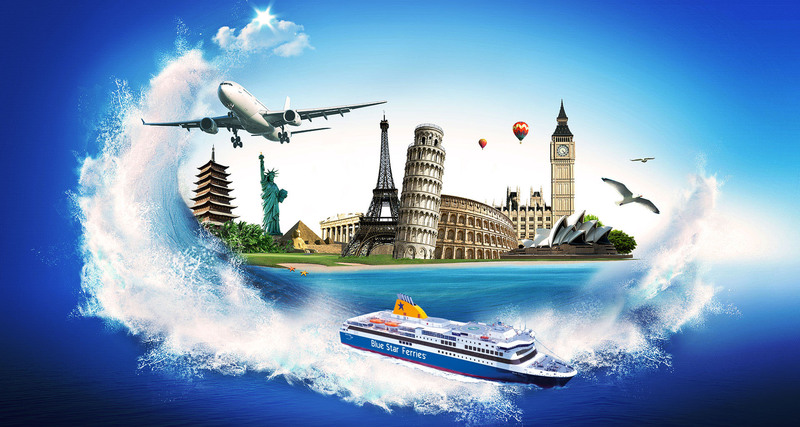 We work with all 400+ major travel venues, just to make your Vacation Affordable. Making Clients happy are our Goals. Contact us today for your Free Quote. We book Worldwide. Like us on Facebook! Licensed Insured and Bonded. FREE Estimates! 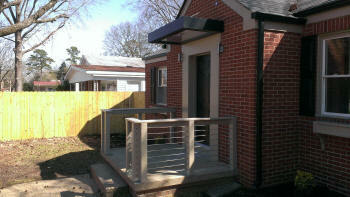 We offer quality construction and remodel services at fair prices. Metal and Shingle roofs. Roof repairs. 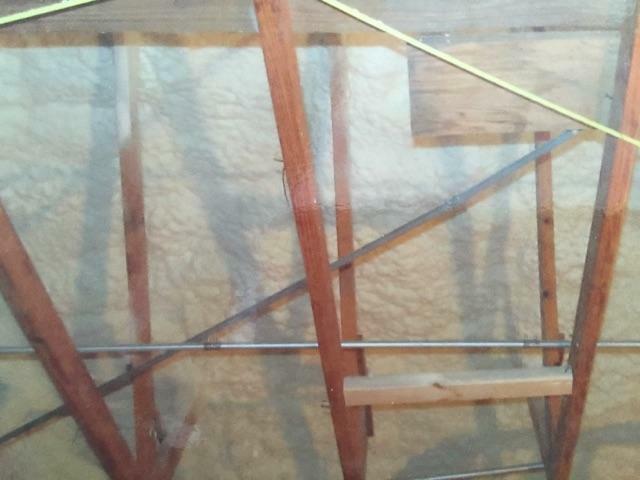 Poly Urethane Spray Foam Roofs and Insulation. 17 years experience. B&C Portable Saw milling is a portable custom sawmill business owned and operated by a Disabled American Vet (with Proof). I bring my sawmill to your place and cut your logs into lumber. The cost is far less than going to your local lumber yard, Lowes, or Home depot to buy the lumber AND you can have me cut it in any thickness or width you'd like at no extra charge. If you have trees fall down or cut down why not have them cut into use able lumber. There is a minimum charge and no job is too big or too small. We have solar panels and complete solar systems of all sizes. And We are your Fox blocks ICF supplier as well. Kristin's Cleaning Service is all about making you feel comfortable in your own home again! We offer top notch cleaning services and get the job done fast and efficiently. We are honest and realiable. Call today for a FREE estimate! Struggling Student? Struggling Student? Not sure where to go or who to ask? Let J3 Educational Consulting Company help you. Our certified teachers can tutor in various subjects and will work with your schedule. Experienced housekeeper. Pricing by the job. References upon request. 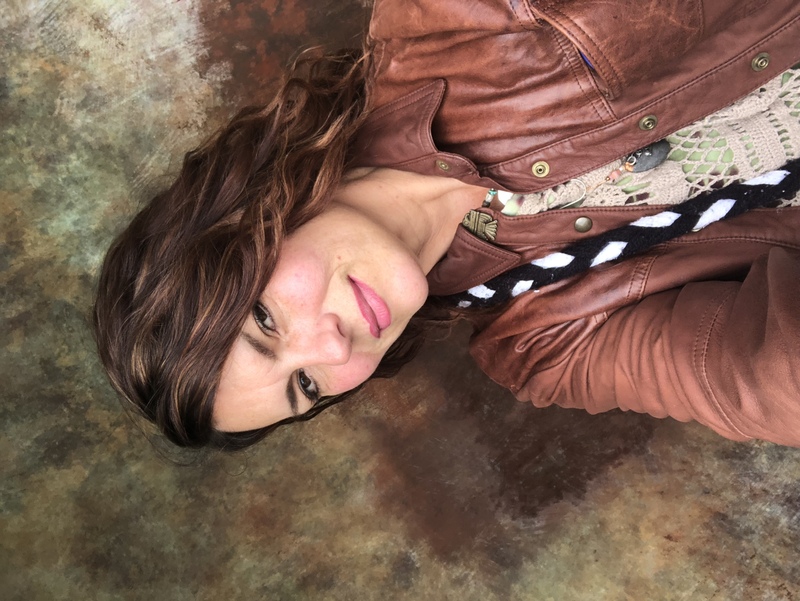 Please call Jackie @ 423-596-7499. Tired of paying over priced cell phone bills? 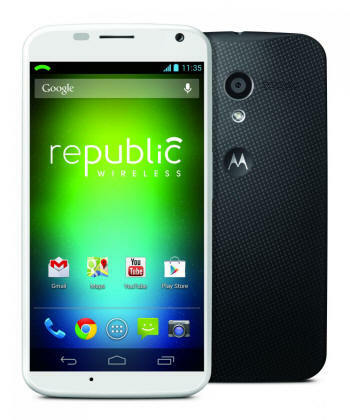 Get Republic Wireless with unlimited talk and text for just $10 a month! Get unlimited talk text and data for just $25! 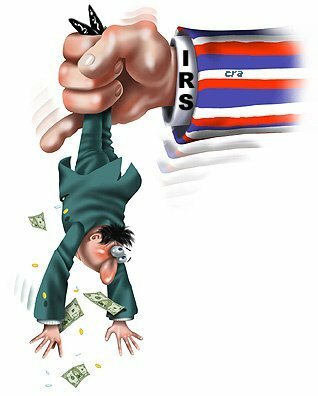 No overage fees ever! Both plans use our highly reviewed and name brand Motorola android smart phones! Phones start at just $99 and there are no contracts. Even get a 30-day money back guarantee if you are unhappy with the product or service! The service runs on Spirit and roams on Version (no roaming fees). Why pay hundreds of dollars a month for cell phone service, when you can get an excellent smart phone and great coverage for just $10 a month! Visit www.10dollarphone.com for more information or to sign up for this service! Price your own cleaning and we will let you know if we will do it. We are located in Cleveland, TN. DECKS AND MORE... 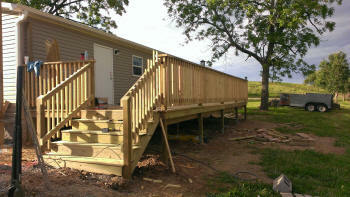 Decks and More; We do any kind of deck from standard to custom. 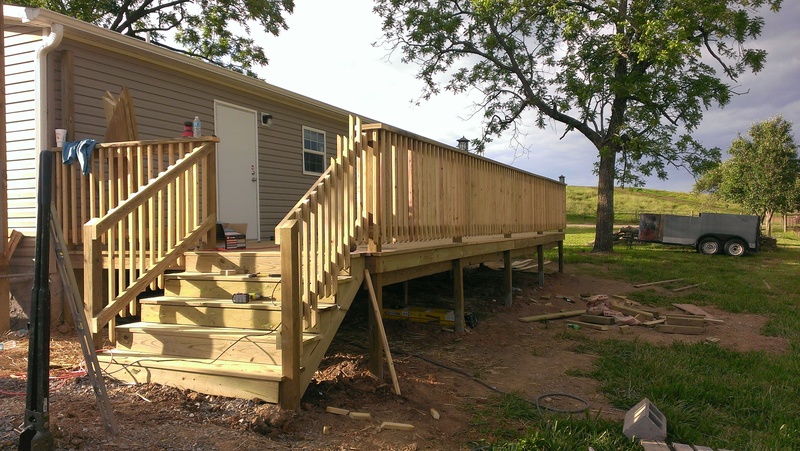 Standard decks starting at $5 per square foot . Slightly higher if out of Cleveland area. We have 30+ years of experience and will come to your site for free estimates. Serving most areas from Chattanooga to Knoxville!! Ooltewah, Hixson, Cleveland, Athens, Sweetwater, Madisonville, Loudon....& southeast parts of Knoxville! We install & repair all types of fences, residential or commercial. Chain link, vinyl, PVC, aluminum, wood, privacy, barbwire, razor wire, page wire, high tensile, electric, wrought iron etc. We build & repair barns. Barns, stables, pole barns, lean to, out-buildings, barn roofs, barn additions, sheds...out buildings. 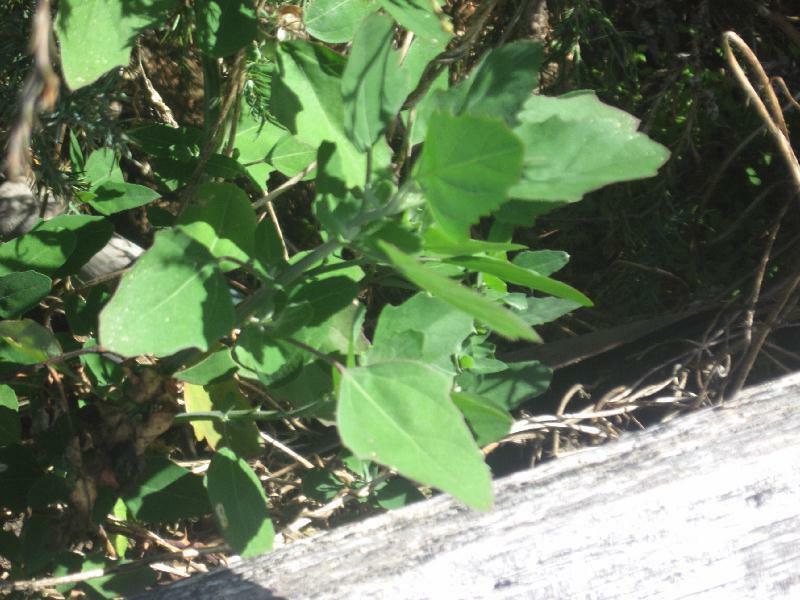 Wild edible, medicinal, useful & poisonous plant ID class. Learn how to feed your family healthy, nutritious plants that you can harvest for free! Learn how to sell wild wild plants for additional income. Masonry work. Custom stack stone, brick, block, stucco, and repairs. One call for complete home repair and remodeling. From big to small we do it all! We provide free estimates and top of the line services. We are cheap, clean, and fast. 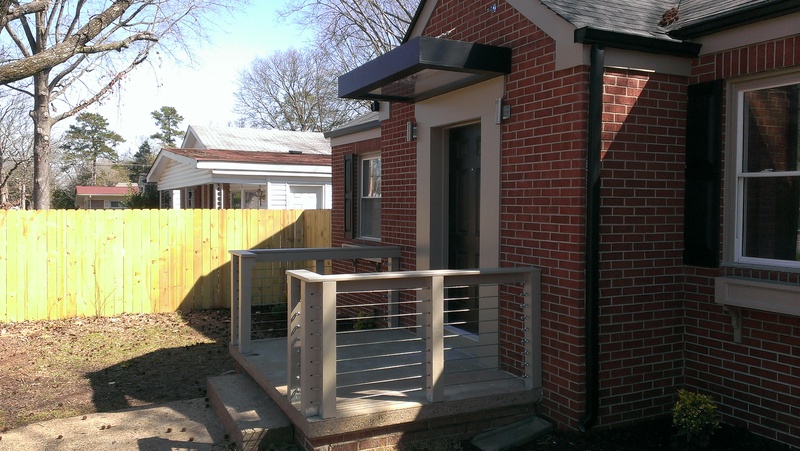 Call 443-521-0680 TODAY! !